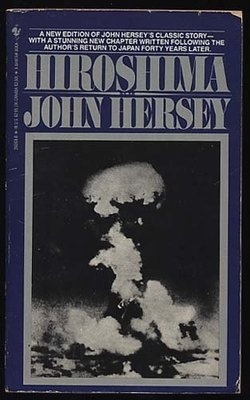 Hersey follows six ordinary people who happened to be living in Hiroshima on that fateful day, and then he follows them as they endure the after-math of this horrible incident, and this structure was so effective as it allowed the reader to see the utter confusion and horror from a more human perspective as opposed from an international political view. I am not that well versed in the history of why the atom bomb was used (although I have read about it more), but it still sounds like a dreadful idea to me, affecting innocent townspeople who had *nothing* to do with the decisions of the warring governments of different countries. 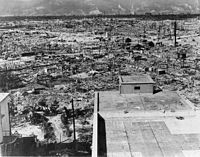 The a-bomb was dropped on August 6 sixty-nine years ago, and so it’s fading from memory as its survivors et al. pass on with just the other day, Google reporting that the last member of the Enola Gay flight crew had died. However, as this horrific event fades into the past, I think it’s very important for people to remember it and apply the lessons learned to present-day world politics. So, this was an amazing read, and, right or wrong, it happened and it needs to be remembered. A powerful read which sent me down the numerous fact-finding rabbit holes on the interwebs to find out more. This entry was posted in Uncategorized and tagged American, history, investigative journalism, Non-fiction by lizipaulk. Bookmark the permalink. It’s an incredibly powerful book, isn’t it? And you’re right – this kind of thing shouldn’t be forgotten. I’d recommend “Black Rain” as a companion read to this, as I mentioned in my post – it’s parallel but from the perspective of a Japanese writer. I am very conflicted about this event. My whole being says it was wrong and yet had it not happened I would not have a being of any sort with which to have an opinion. My father would not have survived another winter in the Far East POW camps and I would never have been born. I think this is a book I should avoid as I am in no position to have an objective view about it. Alex – I completely agree. There is no one “right* answer to this. Would Japan have cont’d on with its military strategy if this hadn’t been done? Who knows. But was it “right” to launch this bomb on innocent people in the name of that? Don’t know. It’s a very complicated issue for me, and I don’t even have that personal connection so I am sympathetic with your confusion. What an amazing sounding book. It really was a powerful book. Highly recommend it. I read this in high school – 30 or so years ago! Still remember it! At the time I think I wanted to find out what happened to Hersey, wether he became ill from the radiation. I think I then followed it up by reading his ‘Bridge at Andau’. What i like about his work is that what he experiences does have an affect on him, he is more than just an uninvolved reporter or journalist. Oops! I meant ‘A Bell for Adano’ not ‘Bridge at Andau’ – which is by Michener! Though Andau is good too!